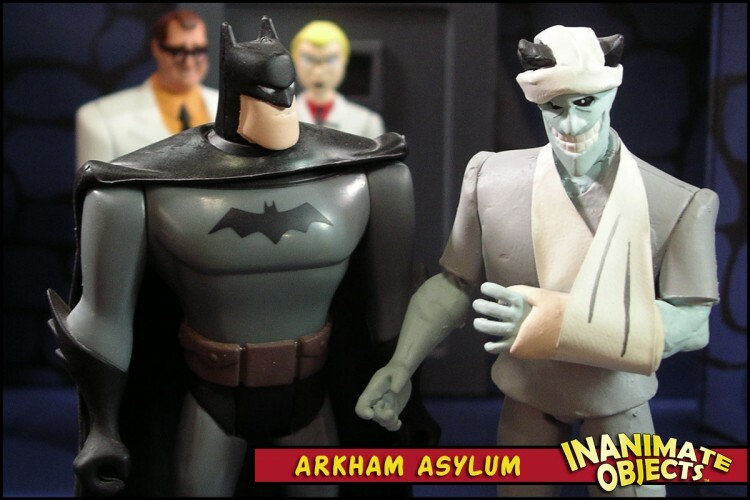 I really enjoy the Bruce Timm image of Harley breaking Joker out of Arkham, with Bats in the background (available at the WB store for $450, should anyone be thinking of me at Christmas). I’d wanted to make this figure for some time, but couldn’t find the right base. As chance would have it, I was working on several other figures, and in a moment of distraction I put the spare parts of the former projects together and lo and behold, I had a Mad Love Joker! His torso, head and shoulders are Wild Card Joker, the legs are from Speed Racer Grand Prix, and the arms are from Dr. Terror, also of the Speed Racer line. 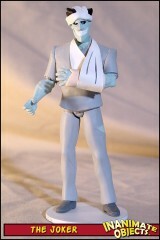 The cast and bandages are sculpy, while the sling is styrene. The only joker you really need know is the joker referee outfit in the episode holiday nights!!!!! “Unless the dear dark night stops you first”!!! !